There are seemingly infinite reasons why you might be in search of a gift for your wife. Whether it's for the usual birthdays, anniversaries, and Valentine's Day or it's the just because gift-giving occasion, you'll run out of gift ideas long before you run out of reasons to give them. Even though it gets harder, that doesn't mean you can give up. You will still be expected to get your wife a gift she loves - 'til death do you part! By the time a woman becomes your wife, you probably know her better than anyone else does. That means you'll know which is more important to her: practicality, the sentimental, or luxury. Once you know which of these she values most, you'll know what kind of gift you're looking for. Narrowing down the category will help you narrow down your gift, too. Practical gifts are those that your wife can use or needs. Think useful. 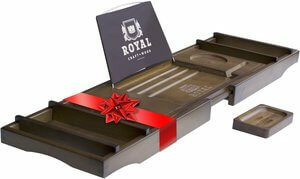 Sentimental gifts tend to cost time, not money and have a special significance. Luxury gifts usually cost the most but require little time (just the time spent working for the money you spend on them). These gifts are the jewelry, the spa days – the extravagant life she deserves but doesn't always get to enjoy. Still feeling stuck? Not to worry. We've rounded up five amazing gift ideas to impress your better half. In case you still need inspiration to get your brain working, we've identified five top-rated gifts that just might be perfect for your wife, no matter whether she's a practical gal or one who loves to be pampered. 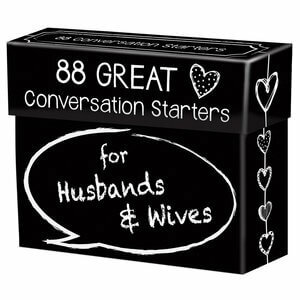 We love this gift for the couple that finds themselves in a conversational lull – when you've learned just about all you can think to ask about one another. This seems like a perfect gift for the couple that's been together for a decade or more and just needs an occasional boost to their communication. Or, to put it in another way: this is a great gift if you've ever found yourself unable to answer when your wife asks you what you're thinking. These prompts will open your communication with ideas like, "Describe your idea of a perfect vacation for us." And each prompt also includes a saying or thought that complements the prompt and will potentially add to your discussion. Pack it for a date night or road trip and put down the phones. Spend some time talking to your wife again! This is definitely an example of a practical gift. Although giving a cleaning gadget to your wife can sometimes go over like a lead balloon, you know your wife well enough to know if this is a good fit for her. You certainly don't want to get this for the wife who's most interested in sentimentality, but for the wife who values a practical gift, this is hard to beat. 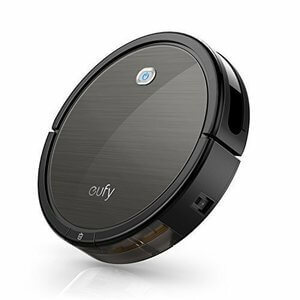 It's a robot that does one of the most monotonous household chores there is – what's not to love? This particular robot vac has thousands of positive reviews on Amazon. It has an improved mobility that allows it to easily transition from pile carpet to hardwood and everything in between. The suction is also improved, making the level of clean you get improved as well. Set up a schedule that will have the vacuum operating while you're away and you'll never need to worry about the carpet cleaning again! Sometimes all a person needs to unwind is five minutes to unload. That's the idea behind this gift. 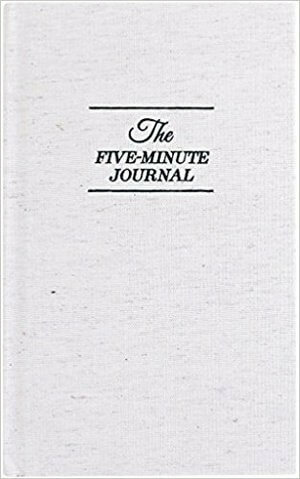 So if your wife stresses, you may want to take a look at this five-minute journal that will allow her to compose her thoughts and take a break to appreciate her life, even when it all seems to much for her – maybe even especially then. But be prepared to give her the five minutes. Sometimes that will mean watching kids, and sometimes it will be when you want five minutes yourself. When you give this journal, make sure she knows you're committed to give her the full five minutes whenever she needs it most (and follow through on that promise). This journal has over 250 pages of prompts that will make her list things she's grateful for, create a statement of affirmation to build her confidence, recap the best parts of her day, and more. This is a perfect way for her to redirect her negative feelings to those of positivity. If you spoil your wife with jewelry, then this could be the perfect gift after years of doing so. 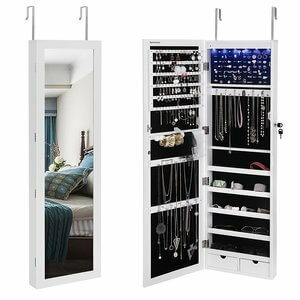 Upgrading your wife from a boring, crowded jewelry box to this upright organizational dream of jewelry storage is both practical and a gift of luxury. She can hang this on the back of a door without damaging any part of the house or you can mount it to the wall for a more permanent fix. This has a spot for practically all of her accessories; rings, earrings, bracelets, necklaces, sunglasses and two drawers at the bottom for anything else that may not have a specific home within. Purchase three AAA batteries with the jewelry armoire and she'll immediately be able to use the light that automatically comes on when she opens it. A lock and keys are included as well to keep her valuables private, making this a perfect gift for mommies with curious kids. This gift is a perfect combination of all three categories; it's practical, sentimental, and luxurious, plus it's a gift you can use as a commitment of time. With a bath caddy, a candle, a book, and a bottle of wine, she is set for an evening of luxury. The act of her taking her relaxing bath will commit you to taking care of everything else while she takes a mini vacation, which shows her how you care about her, and the caddy itself is so practical it has a place for everything. You can expand this tray up to 43 inches, making it an adjustable fit for almost every bathtub, and it's made with a durable bamboo wood that makes its 100% money-back guarantee practically moot. There are slots for her phone, her tablet or a book, a cup or candle holder, removable trays, and a specialized wine glass holder that will secure the stem of her wine glass safely so as to prevent spills. This even comes with a separate soap holder that is made from the same hearty bamboo. Whether you're married to a woman who loves the finer things in life or one who simply wants a clean house, these gift ideas are a great starting point if you're at a loss for what to buy the woman in your life. If none of the gifts above seem just right for your gal, they just might inspire you to come up with the perfect gift to knock her off her feet.